I’ve been meaning to make a waistcoat for a while. My old ones don’t fit (sadness). There was a party last night that made a good excuse. I took the fitted bodice pattern from this dress, converted it to princess seams, added length and flare below the waist. Then pin fitted it and proceeded with little more review so I could have one made in time. It has come out a bit too roomy, but it’s wearable. I’ll have a another look at it when I have enough brain to possess the needed critical eye. The plaid shirt is not the best pairing, but it was hanging to hand. 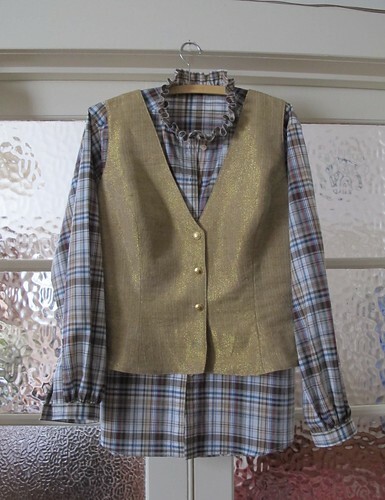 The gold fabric was left over from a waistcoat I made maybe 20yrs ago. Old cabbage! It’s a loose woven cotton with a hand loomed look and lurex thread through it. 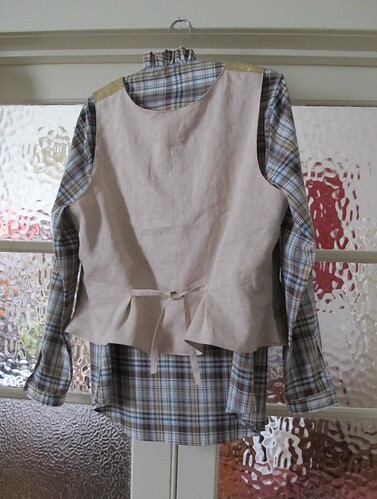 The back and lining is fine linen and has a simple tie belt set into a pair of tucks. Here it is on. I wanted this one as a comfy corset alternative, so I do need to take it some I suppose. With the rest of the ensemble. I adore my top hat, any excuse to wear it! The tail coat is well worn but not by me. I bought it cheaply in NZ over 2yrs ago. This is it’s first wearing since. The poor thing needs a bunch of mending. I really must do that and have it cleaned so it can be safely put away for next time. It’ll look tattier with the moth holes mended, but still wearable, at least as fancy dress. Possibly the best thing about this project…. it’s the first thing I’ve sewn on the 1230 after it came home from it’s service. She has behaved so far. Fingers very crossed for that to continue as long as possible. Completely ridiculous though if it turns out that I put myself through over six weeks of drama and distress for a machine that just needed a service.